The Quran Academy developers intend to actualize a complex of various learning mechanisms, each of those is essentially a distinct and big project. For now, we are at a very early stage of development, but you already have the possibility to try a lot of sundry tools we have elaborated. We strive to create one of the most convenient tools for reading the Noble Quran. Already today you can find in it a whole set of unique opportunities, which are almost nowhere else. Word-by-word translation. You are able to see the translation of every word of the Quran into a language you choose. We by this time have almost completed translation into Russian; translation into English has already been uploaded to our website. 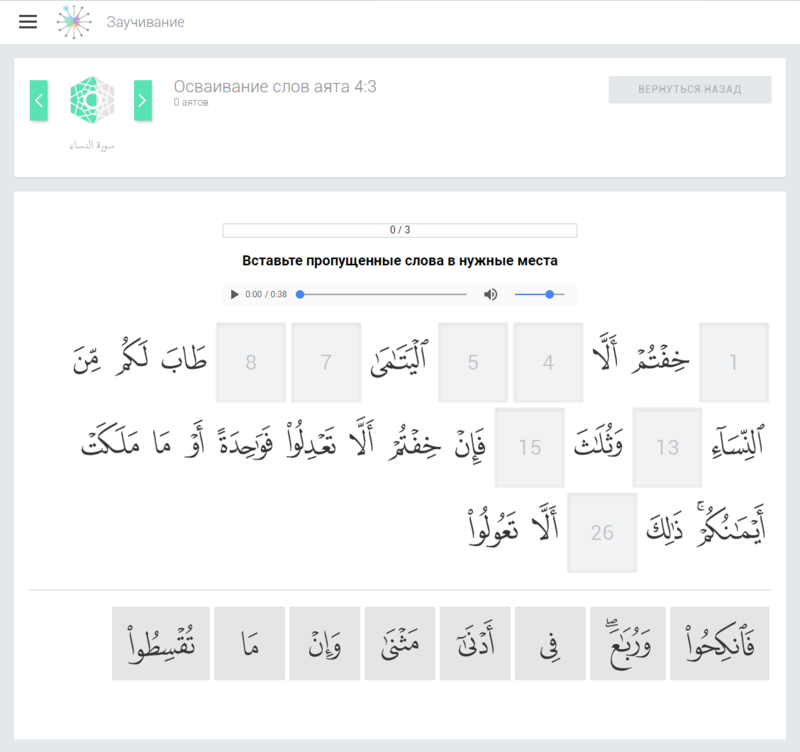 We are also working to translate the Quran into Bashkir, Tajik, Azerbaijani, and Turkish. Various tafsirs. You can open any of seven main tafsirs of the Quran in the Arabic language. 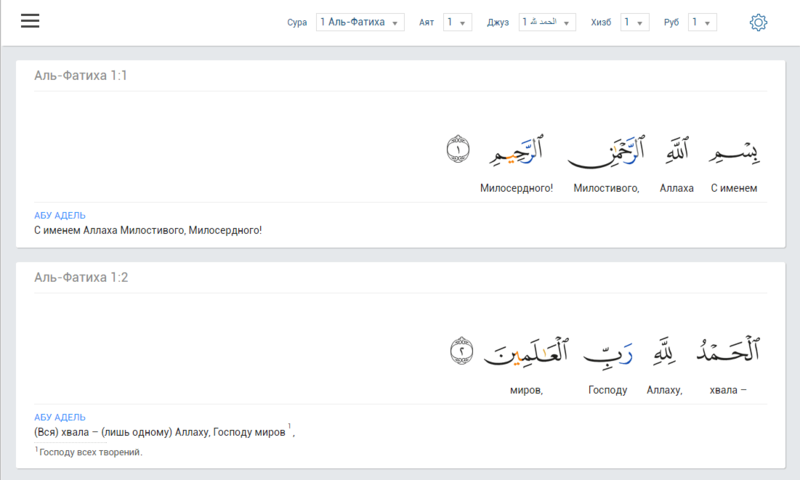 You are also able to view two most famous tafsirs in Russian which are Al-Muntakhab and Al-Saadi. Moreover, our volunteers are now working to make a translation of Tafsir Ibn Kathir available on our website. Highlighted tajweed rules. You can use our screen prompts in order to learn to read the Quran correctly. Screen prompts with tajweed rules appear right after you put the mouse pointer on a highlighted letter. Various navigation regimes in the Quran. You can switch over different imaging regimes, as it is possible to read the Quran by verse, sura, rub, hizb, and by juz. You can also turn on the continuous reading regime and read verses one by one in a flow. We are working on creating interactive training courses, that include video lectures, as well as tests with the question sets to check your knowledge. Also, after completing the course, it will be useful for you to pass the final master-test, during which you will have to check all your knowledge of the course. This section is to a certain extent similar to the Quran Dictionary, but here you will work with the tools, the main purpose of which is to give you an opportunity to memorize the ayahs of the Noble Quran by heart as soon as possible. Complete the ayah . You are given a partially filled ayat with empty cells. You need to fill in the missing words correctly. Listen and fill in the words. You are given an opportunity to listen an ayah. After that you are to fill in its words in the correct order. place the words in accordance with the translation. You are ghiven a set of empty cells. Your task is to insert words of ayah into the required cells in accordance with the translation.